Our recyclable postal tubes are perfect for shipping and storing posters, plans, prints and artwork in A1 sizes. With a choice of 4 diameters, each cardboard tube is supplied with end caps designed to secure the contents throughout the move or storage. 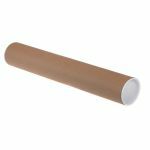 Ideal for packing rolled items up to A1 size; (841 x 594 mm or 33.1 x 23.4 in), our cardboard postal tubes are made from strong materials, ensuring complete protection to your documents and safeguarding them from dirt and moisture. Quick and easy to use, our packaging tube is so tough it can be reused many times. * There is currently a lead time of 2-3 days on these cardboard tubes. The durability and versatility of our postal tubes will save you from all the worries about safely shipping or storing your A1-sized files, prints and documents. Manufactured from strong and long-lasting cardboard, our packaging tube offers total protection to your items whether in transit or tucked away in the store room. Complete with plastic end plugs, our postal tubes provide a professional presentation and storage solution for your customer. With our cardboard tubing you can avoid creases and folds in your documents and damage in the post. Our tube mailing is highly cost-effective because it is made from extra strong spiral wound cardboard for a reliable performance, which means our postal tubes are long-lasting. Being made from recycled material, they are also biodegradable. Our economical and strong cardboard postal tubes provide attractive packaging to a wide range of documents with A1 sizes such as plans, artwork, calendars, prints, maps, architectural drawings and posters.